The research team’s goal was to see if packing a solution with carbon nanotubes in an appropriate configuration could significantly increase the amount of energy stored. One of the more interesting findings of the team, in fact, was that while they were unable to hit the necessary density of azobenzene molecules, adding carbon nanotubes drastically increased the overall efficiency. One of the most fundamental barriers to the widespread adoption of renewable energy has been the inconvenient truth of planetary rotation. Solar power has advanced enormously over the past few decades but panel efficiency and solar concentration plants are of limited assistance when Apollo is busy elsewhere on the Earth. Now, researchers think they’ve found a partial solution to that problem by combining the known properties of one substance with everyone’s favorite technological advance: carbon nanotubes. One of the problems with electrical power generation is that we’re much better at generating electricity than we are at storing it. This makes it difficult to rely solely on renewable sources for electricity; power generation can vary substantially in any given area depending on prevailing weather conditions at the time. One solution to the problem is to build out 2-3x the capacity needed to provide average power consumption, but the capital costs associated with doing so are extremely high and there are only so many ideal spots to stick a giant solar concentration facility in any case. What’s needed is a simple method of converting energy gathered during the day into a resource that can be tapped at night — and Timothy Kucharski, a post-doc at MIT and Harvard, thinks his team has found it. Kucharski’s work is based on the well-known properties of azobenzenes. 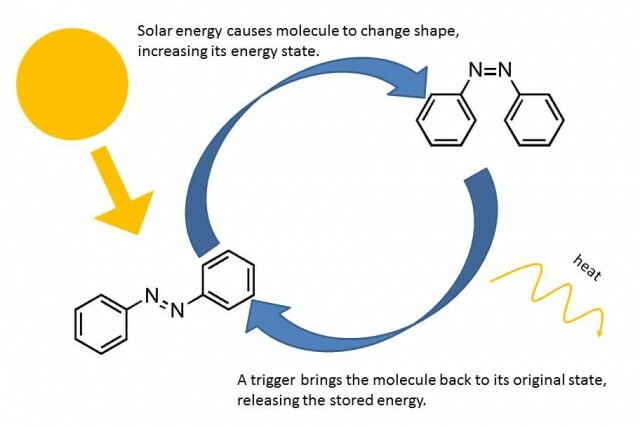 These are molecules, dubbed photoswitches, that have one particular molecular configuration by default but, when struck by certain frequencies of ultraviolet light, assume a new configuration, as shown below. When the molecule “relaxes” from its excited state to its base state it releases about 50KJ/mol-1 of energy. The research team’s goal was to see if packing a solution with carbon nanotubes in an appropriate configuration could significantly increase the amount of energy stored. One of the more interesting findings of the team, in fact, was that while they were unable to hit the necessary density of azobenzene molecules, adding carbon nanotubes drastically increased the overall efficiency. The carbon nanotube’s form chains to which the azobenzene molecules can attach, with multiple nanotubes locking together. The end result was that instead of a 30% energy density increase, the researchers saw a greater-than 200% increase — from 50KJ/mol-1 to 120KJ/mol-1. The goal would be to create a short-term thermal battery that could be used to power a stove or other heat sources during the night after charging all day. A gravity system would be simple, with few moving parts. The long-term goal is to create a system that could be used to provide thermal power for entire buildings and to further increase efficiency. While it’s not a full-scale solar battery, discoveries like this could make solar power far more useful in developing nations, which still rely primarily on wood or peat for cooking fuel.